With a big Fourth of July win yesterday, the Padres continue to inch closer to the .500 mark. Each of the starting nine collected at least one hit in yesterday’s win, handing Tim Lincecum his seventh loss of the season. Yesterday was also interesting in that each of the Padres pitchers was credited with either a win (Richard), hold (Frieri, Spence, Qualls, Adams) or save (Bell). The four holds match the most by any team this season (14th time) and tie for the most ever in a single game by the Padres (6th time). The Friars are 9-3 in their last 12 tilts and have not lost consecutive games since June 19-20. Over the current 12-game stretch, the Pads are posting a 2.68 ERA (31 ER/104.0 IP) and have held opponents to three or fewer runs in 10 of those contests (including two shutouts). The starting rotation has been credited with seven of the nine wins, recording a 2.57 ERA (20 ER/70.0 IP). On the offensive side, Cameron Maybin (.341), Chase Headley (.368) and Will Venable (.323) are each hitting over .300 during the 12-game stretch. After being optioned to Triple-A Tucson in late May, Venable has had a strong showing in his return to the Big Leagues. Since beening recalled on June 9, Venable is hitting .326 with a.385 OBP and .478 SLG (.863 OPS). The Pads are wrapping up the road trip with a two-game series that starts tonight in Arizona. Beginning Wednesday, the boys are back for an eight-game homestand against the Milwaukee Brewers (May 18-19), the “natural rival” Seattle Mariners (May 20-22) and the St. Louis Cardinals (May 23-25). 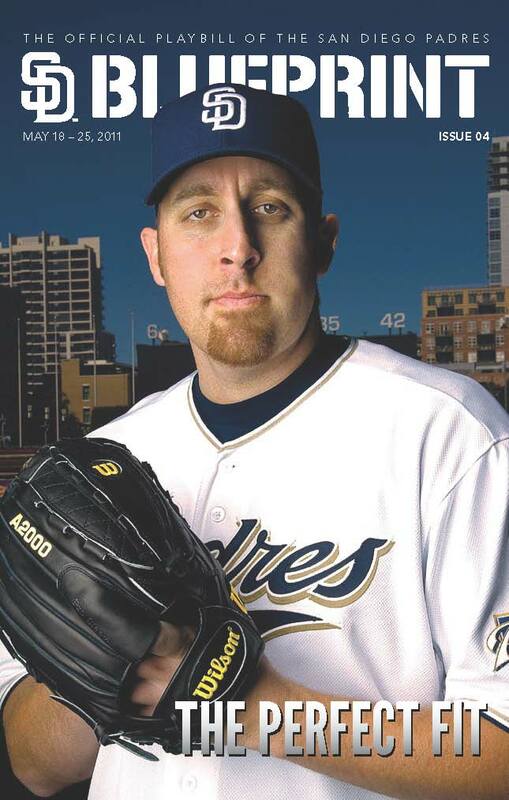 Here’s a preview of the new Blueprint cover, featuring local boy Aaron Harang. Remember, it’s free when you come to the game. This issue also features Mike Adams, Dave Roberts and a look back at the 1987 home opener. We’re currently working on making all issue of the Blueprint available online. As soon as they are ready, you’ll be the first to know.